Building a blown first-generation 392 Hemi for a ’32 Ford hot rod is certainly a worthwhile project that will turn heads and shake the streets along a cruise. But finding suitable parts to withstand the boost and create a streetable powerplant from a foundation that is more than 50 years old can present noble challenges. 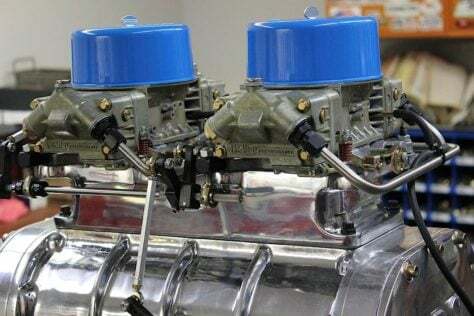 A Wyoming-based customer recently approached Borowski Race Enterprises in Rockdale, Illinois, with an original 1957 392ci Hemi engine that had been massaged slightly by another machine shop. Taking on another shop’s project always sends up a red flag, and the customer had a few specific requests to honor, as well. With that in mind, Borowski worked out a game plan that would provide sharp throttle response and horsepower in the 650 range. The projects starts with a surviving Hemi block-head-crank combination — it’s not an earlier 354ci engine converted to 392. The customer had owned the engine for several years, saying that it languished in another machine shop near the owner’s hometown in Wyoming. That shop had already decked, bored and honed the block before Borowski received it. The customer supplied Borowski with this 1957 model 392 Hemi block that was bored .040-over and finish-honed to 4.040 inches by another shop. Integrity of the work was verified, and the only additional machining performed at Borowski was an align hone. Main bearings came from King, which was the only source Livesey could find for this particular engine. Total displacement is 401ci. The first-generation early Hemi is not nearly as common of an engine as its big-block offspring. As such, tracking down parts for these engines can be a chore. “I was surprised at how difficult some of the parts were to find, since Nostalgia Top Fuel had to run a 392 Hemi engine until recently,” says Livesey. Custom JE pistons feature a .162-inch dome height, weigh 591 grams each and provide a final compression ratio of 9:1. The Speed Pro Hellfire rings are gapped at .065. The Crower billet steel connecting rods measure 6.950 inches center-to-center. Everything swings on the stock 392 Hemi crank, which required no machine work. 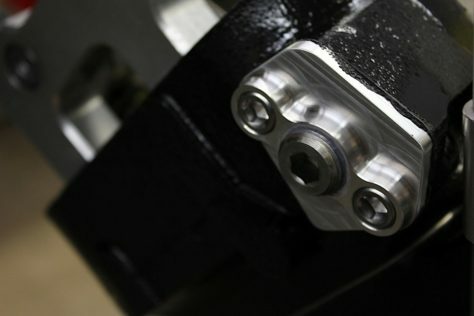 The camshaft is a custom grind from Bullet Racing Cams with 112-degree lobe separation. Gross lift is .548/.539 with 235/250 duration at .050. The Cloyes billet-steel, double-roller timing set comes with multiple keyways and is adjustable in 2-degree increments. It also has a .005-inch shorter centerline distance than stock. A Steff’s oil pan and modified Chrysler 340 oil pump provide lubrication. With no specific 392 Hemi connecting rods available, the customer preferred a set of custom Crower billet steel rods. Livesey admits the rods are overkill for an engine of this output, and he later discovered that big-block Mopar 440 rods could have been substituted. This would have required a different piston package. The JE Pistons are custom ordered to yield a 9:1 compression ratio. Borowski’s Hemi uses a disc-type freeze plug available at Hot Heads. These trick pieces utilize O-rings to ensure sealing and locking tabs for secure fitment. Adjustments are made with an Allen wrench. Livesey prefers this design over many screw-in freeze plugs. The stock forged-steel crank needed no additional machining and was laid in King main bearings. ARP studs are used throughout the build. Livesey chose a custom ground cam from Bullet Racing Cams and installed it at 109 degrees intake centerline, a 3-degree advance from stock. A Cloyes double-roller timing chain turns the cam. A Chrysler 340 oil pump conversion from Hot Heads was also installed. This is a common upgrade for early Hemis. The 340 oil pump flows 30 percent more oil volume than the original design. Hot Heads converts these pumps to be a direct bolt on and upgrades them to use a chromoly driveshaft. The oil pan comes from Steff’s, and a K&N oil filter holds back the grime. Hot Heads also supplied the trick freeze plugs. The customer specifically wanted hydraulic rollers in the valve train, so a set of Crane Cams link-bar lifters were installed. At the end of the Smith Brothers 5/16-inch-OD pushrods are Titan billet rocker assemblies. These rockers will bolt to either a stock Hemi or aftermarket heads and utilize an Allen-head adjustment. Pushrods are a particular concern when building an early Hemi. The passages in the heads are quite small, limiting the potential outside diameter of the pushrod. With a mild a hydraulic roller cam, a large diameter pushrod was not necessary for this engine. but further machining would have been necessary with a more aggressive cam package. The customer’s request for a hydraulic roller cam added a little complexity and expense to the project. The Crane link-bar hydraulic roller lifters require no additional machining to the block. The use of a hydraulic-roller camshaft did allow for Smith Brothers 5/16-inch OD, .120 wall pushrods. The Titan billet rocker arms are made from anodized 7075 T56 aluminum and feature a unique Allen-head system for valve adjustment. The rockers are compatible with virtually any type of cam. The Hemi, of course, is legendary for its cylinder head design. As such, the stock heads required no additional machining but did receive a good cleaning and valve job. Complementing that work is a fresh set of stock-sized valves from Racing Engine Valves (REV), as well as Comp Cams springs, locks and retainers. Cometic multi-layer steel (MLS) head gaskets provide the sealing when the ARP studs are tightened. The original 392 Hemi cast iron heads were freshened with a set of REV 2-inch intake and 1.75-inch exhaust Super Duty valves, both stock sizes for a 392. The springs and locks come from Comp Cams. The dual valve springs are 1.437 inches OD, 409 lbs/in rate, with a 1.050-inch bind height. Clay is used to check for piston to valve clearance on both the intake and exhaust valves. Test springs were installed on one valve in each cylinder head to perform this check. Until recently, the only water pumps readily available for the 392 Hemi have been a rebuilt versions. Reliability of these was sometimes questionable, and the original pump design is not as heavy duty as today’s modern castings. Hot Heads solves that problem with an adapter kit mount a big-block Chevy water pump. Other cooling tricks from Hot Heads included water-passage block-off plates and BBC thermostat housing. The BBC water pump adapters supplied by Hot Heads allow for a more common pump and provide additional blower clearance as well as increased coolant volume. The rear water-outlet ports on the back of both heads are blocked with billet adapters. The thermostat and front water outlets for the heads also came from Hot Heads. I was surprised at how difficult some of the parts were to find. The customer also already owned the polished BDS 6-71 supercharger that was recently refreshed with new seals and gears. Hot Heads supplied the blow-off valve in addition to the valley cover. 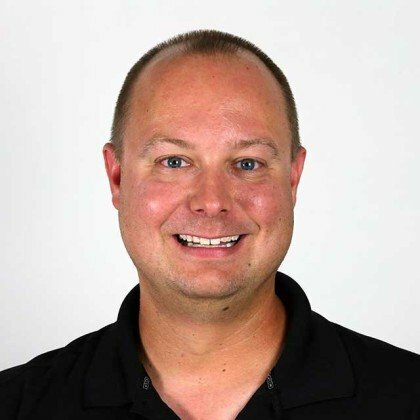 “The parts we ordered from Hot Heads were very high quality, fit well, and didn’t require any additional fabrication to get them to fit,” praises Livesey. With the supercharger set in place, attention turns to what was going to top it. Weiand supplied the dual-carb adapter plate. Feeding the entire setup is a pair of boost-referenced Holley HP 950cfm carbs that are secured with Moroso studs. Weiand also supplied the stainless dual-feed fuel line kit. 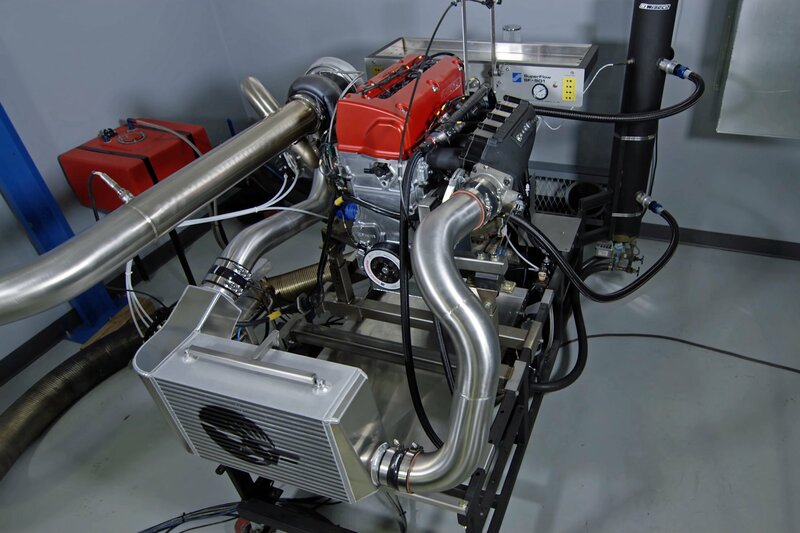 The BDS supercharger was another customer-owned piece that had recently been rebuilt. A 55-tooth supercharger pulley and a 52-tooth crankshaft pulley result in a 5-percent overdrive, yielding 10 psi at 6,000 rpm. The blower belt is from Dayco. Carburetors are dual 950 CFM Holley HP. Other than boost referencing, they are out of the box with jet adjustments for tuning. Final jetting was set at 78 primary, and 88 secondary. The MSD distributor is advanced at 33 degrees. Coated Sanderson lakes-style headers will be used in the rod, and the customer is planning to cap them and connect to a full exhaust system. Five dyno pulls were performed to break in and tune the engine. All runs were made on 92 octane pump gas. The engine was filled with eight quarts of Brad Penn 15w40 high performance engine oil. 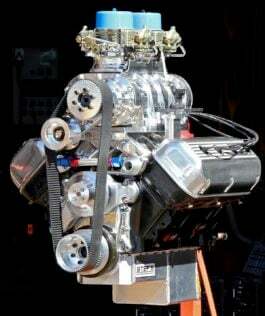 The engine made peak power of 673 horsepower with 10 psi boost at 6,000 rpm. Torque peaked at 648 lb-ft at 4,600 rpm. Carburetor jetting was adjusted towards the lean side with air fuel ratios in the 12.1:1 to 12.2:1 range at peak horsepower. The engine makes peak power horsepower at 6,000 rpm with 10 psi of boost. This is the upper level of the boost range for a pump gas setup, given the relatively high for the application 9:1 compression ratio, many other engines would not tolerate this much cylinder pressure without detonating. However as Livesey pointed out, the Hemi combustion chamber is much more forgiving than a typical wedge style chamber, allowing for the increased pressure. The lakes-style headers also contribute some to the lean numbers. The customer will run a full exhaust on the rat rod and cap the headers, which will fatten up air-fuel ratio. Also, living 5,000 feet above sea level in Wyoming will also richen the mixture. In fact Livesey beleives the engine may need to be jetted even leaner due to the altitude to maintain the desired throttle response. The build took six months with parts delays causing much of the stretch. Now that it’s delivered, the blown Hemi will add nostalgic flare and street racing demeanor to a hot rod, while giving it impressive, yet streetable, performance. Livesey says the customer’s next project is a blown Ford Boss 429 engine. Wonder if it’s going in a Mustang or pickup truck?